International experts, scholars, public figures and decision-makers joined together to focus on blockchain technology at a BMI conference held in Montenegro. The increasingly popular financial tool enables secure online activity and verification of transactions between parties, without requiring a central or trusted management entity. The conference discussed the possible applications of the technology by social and governmental institutions for various social purposes. Opening remarks were delivered by BMI Head Prof. Itai Sened of TAU’s School of Public Policy. The keynote speaker was Prof. Katarina Adam of the University of Applied Sciences, Berlin. Among the participants were the Hon. Vaclav Klaus, co-founder of the Vaclav Klaus Institute and former President of the Czech Republic; Mrs. Dragica Sekulic, Minister of Economy of Montenegro; Mr. Igor Luksic, former Prime Minister of Montenegro and BMI Board Member; Ms. Yael Rozencwajg, CEO Blockchain Israel; and Ms. Eve Guterman, TAU BMI Fellow. “We believe that this conference will be merely the beginning of international cooperation in research and policy making between BMI and prominent figures in the field of blockchain, continued President Djukanovic. 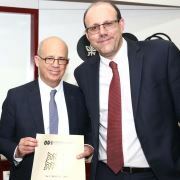 Past BMI conferences have been held in Israel, Finland, Malta, Georgia and Armenia.